What is your favorite Halloween treat? Do you start digging into the Halloween candy as soon as you buy it? Do you start drooling at the thought of a caramel apple? Do you start dreaming of pumpkin spice the moment that the Fall season starts? 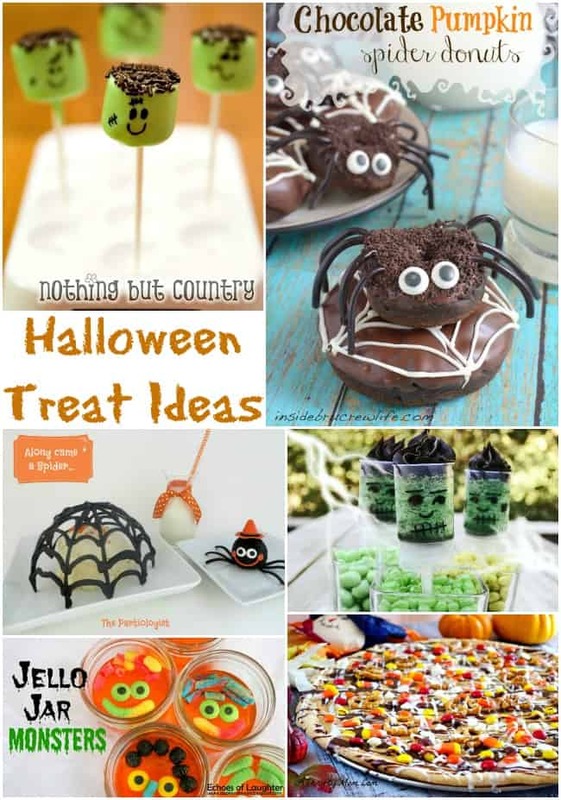 Here are some delicious Halloween treat ideas from some talented bloggers. Get your napkin ready because I’m sure there will be some drooling going on! along with the recipes and instructions. I love recipes that not only sound delicious but look adorable too. 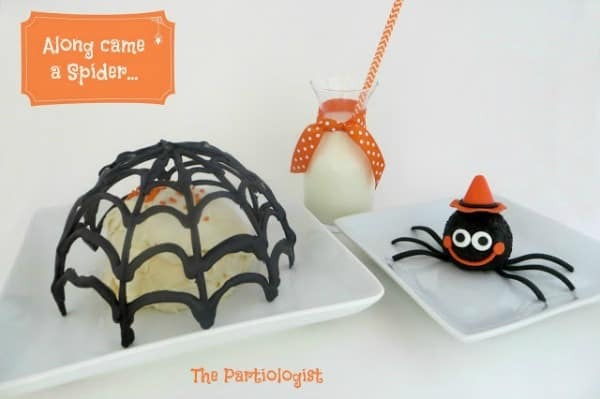 This Chocolate Web and Cake Pop Spider by The Partiologist would be so fun to serve your kids during the Halloween season. 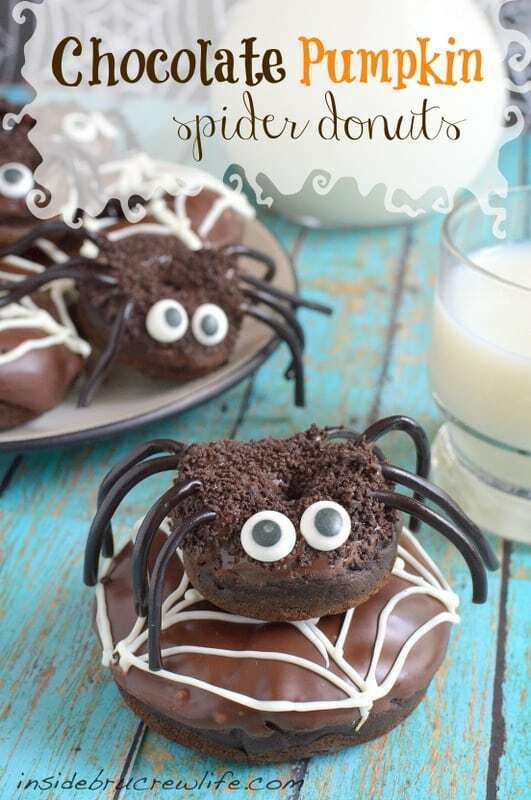 Speaking of adorable spiders, check out these Chocolate Pumpkin Spider Donuts by Inside BruCrew Life. Notice how the tasty little spider is sitting on a donut web? How clever! Halloween is the perfect time to encourage your kids to let their creative side run wild. Nothing tastes better than a cute Halloween treat that your kids helped to make. 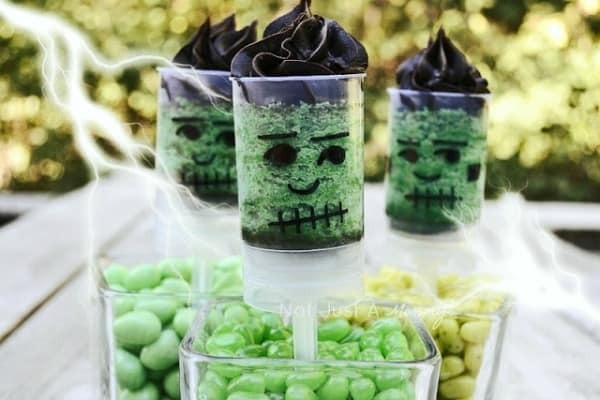 These Frankenstein Marshmallow Pops by Nothing But Country are just as fun to eat as they are to make. 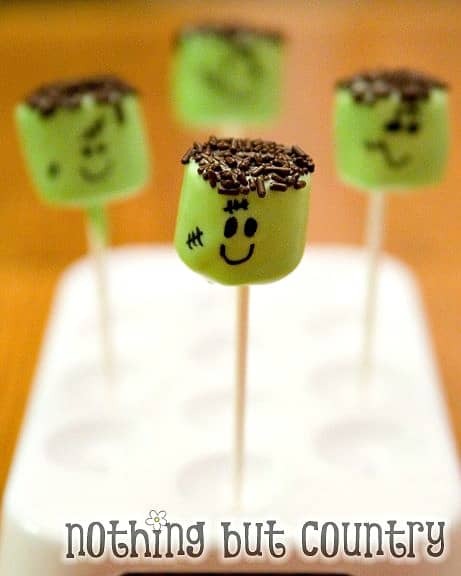 While on the topic of Frankenstein treats, check out these Frankenstein Pops by Not Just a Mommy! These would be the perfect treat for a Halloween play date. I don’t think I’ve met a child that doesn’t love Jello. 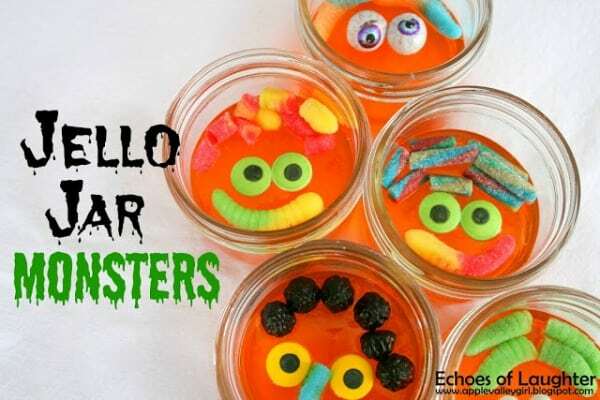 Echoes of Laughter has such a clever idea for Jello Jar Monsters! The kids will love trying out different faces on their monsters. Pizza and chocolate – two of my favorite foods! 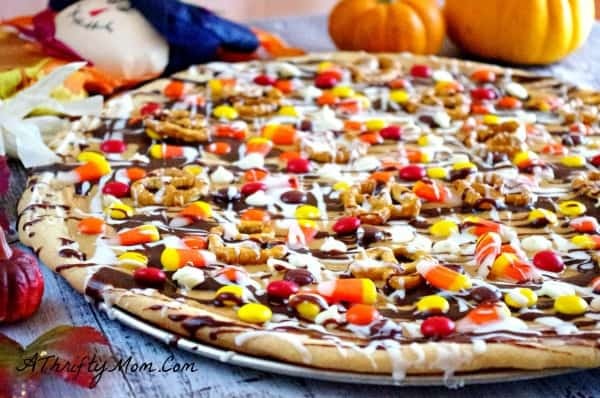 A Thrifty Mom has created this delicious Fall-Tastic Cookie Pizza that’s sure to be gobbled up quickly by your family. I can never turn down a treat with “caramel apple” in the description. 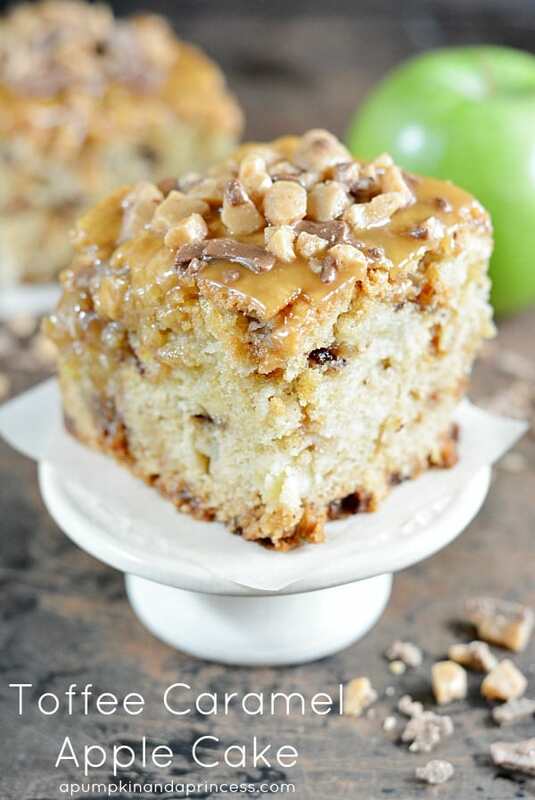 This Toffee Apple Caramel Cake by A Pumpkin and a Princess is perfect for a Halloween dinner party or a moms’ night in celebration while watching some spooky movies. What are some of your favorite Halloween treat ideas? Let us know in the comments below. For more delicious ideas, be sure to follow us on Facebook, Twitter, Pinterest and Bloglovin’. Those jello jar monsters are so cute! They would be perfect to take to school for lunch on Halloween. So many cute ideas for Halloween! Thanks for putting this together Cheryl. 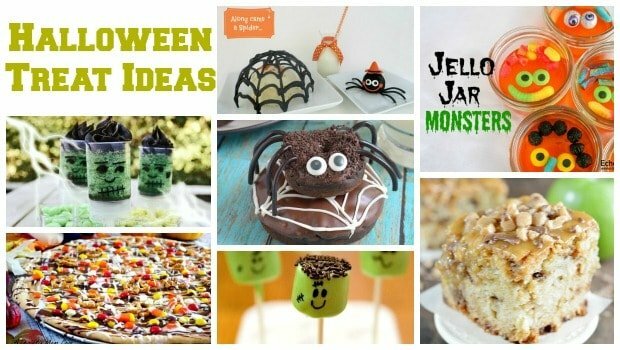 Those jello jar monsters look so fun to make, a project and treat for the kids! What great ideas. We’re having my daughter’s birthday party the week prior to Halloween and we’re making it holiday themed…I love these ideas especially the Frankenpops and the spider donuts!